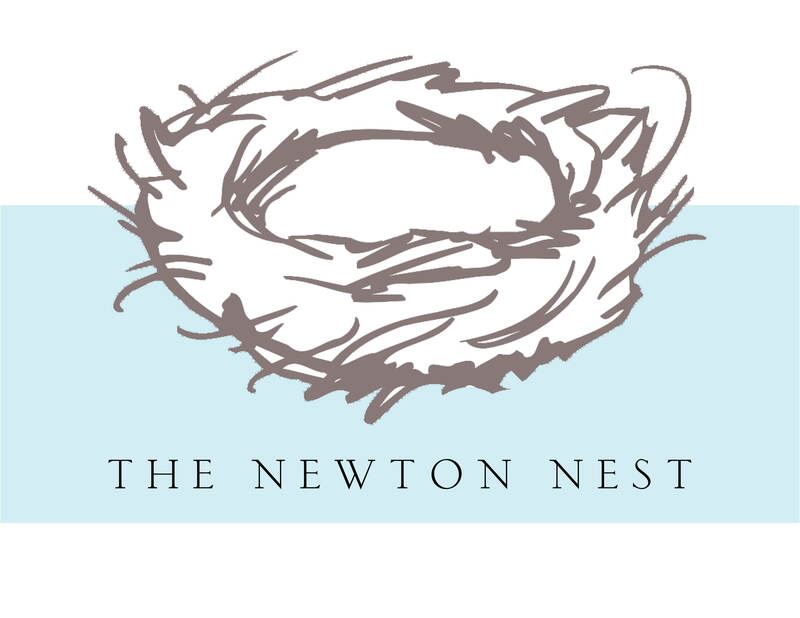 The Newton Nest | Two love birds (or Dodo birds?) 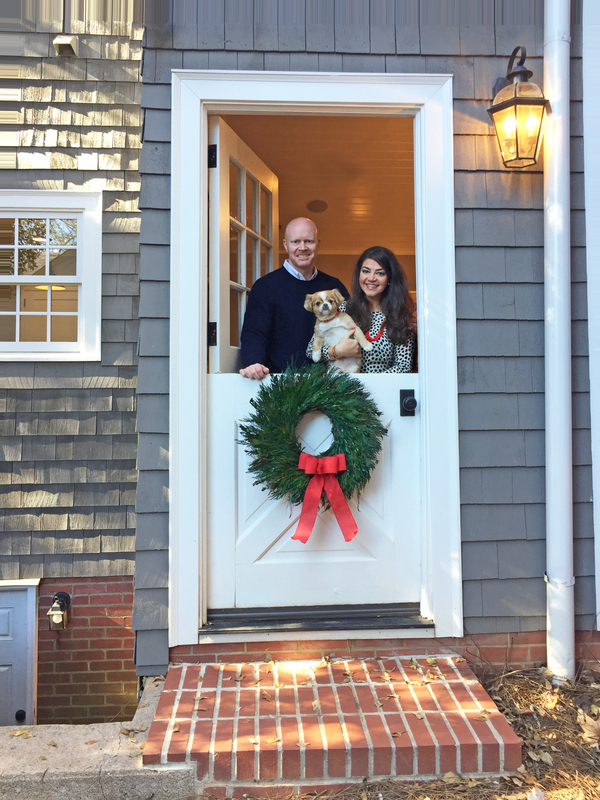 taking on the project of a lifetime—renovating a 1940s Cape Cod into their dream home. Two love birds (or Dodo birds?) taking on the project of a lifetime—renovating a 1940s Cape Cod into their dream home. Miss Pepper and Chasing Squirrels. So, you can’t have a fireplace without a good mantelpiece, am I right?? Our family room fireplace has come a loooooong way, my friends. Early on, we knew this was one of our little house’s “problem areas” considering every time it would rain, water would flood in through the firebox. 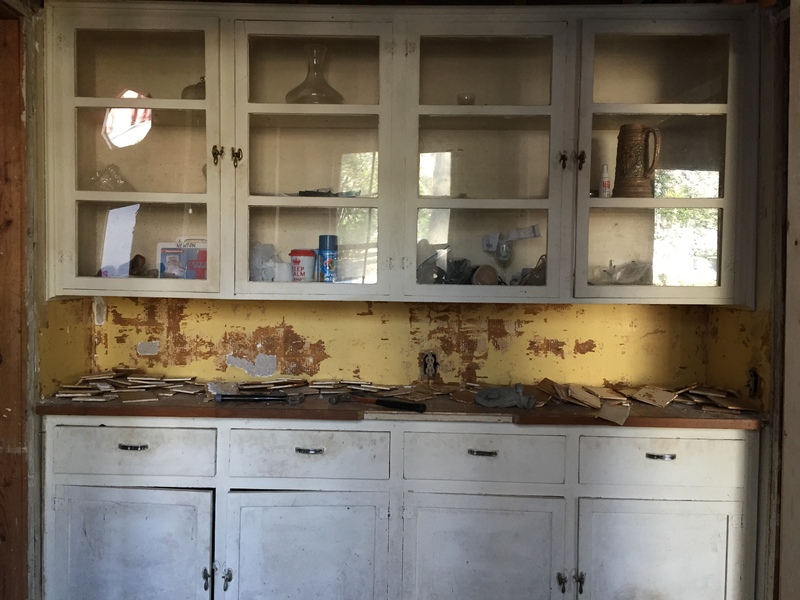 This is a very early “before” picture…like, before we closed and cleaned the belongings out of the house…but you can see the water damage has rotted the entire mantelpiece. Once we tore away the wall, we discovered that the brick fireplace surround had completely separated from the chimney. As you may remember, we completely rebuilt the wall on which the fireplace sits and we even contemplated cutting our losses and removing the entire thing (chimney and all) during a moment of insanity. But with the help of some professionals, we were able to diagnose the problem, repair the chimney and rebuild the firebox. With all the brickwork complete, it was starting to look like a proper fireplace again…except we were still missing the crowned jewel, our mantelpiece! …realizing this is not a one-man job. New firebox, flue, surround and hearth! View from the outside; no more leaking! Ready for her mantel to arrive! Ta-daaaaa! She’s back and better than ever! From the very first time we laid eyes on this door, we knew it was a keeper. It couldn’t stay in its original location because – as you know – we removed the wall between the kitchen and garage-turned-family-room, but there was no way we were getting rid of this little beauty! 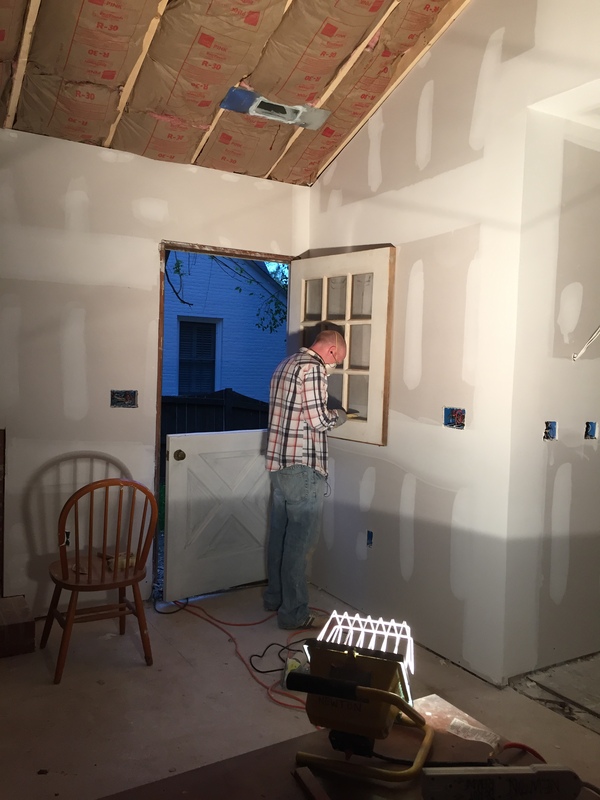 So we decided to make it an exterior door leading from our family room out to our side yard. Perfect! 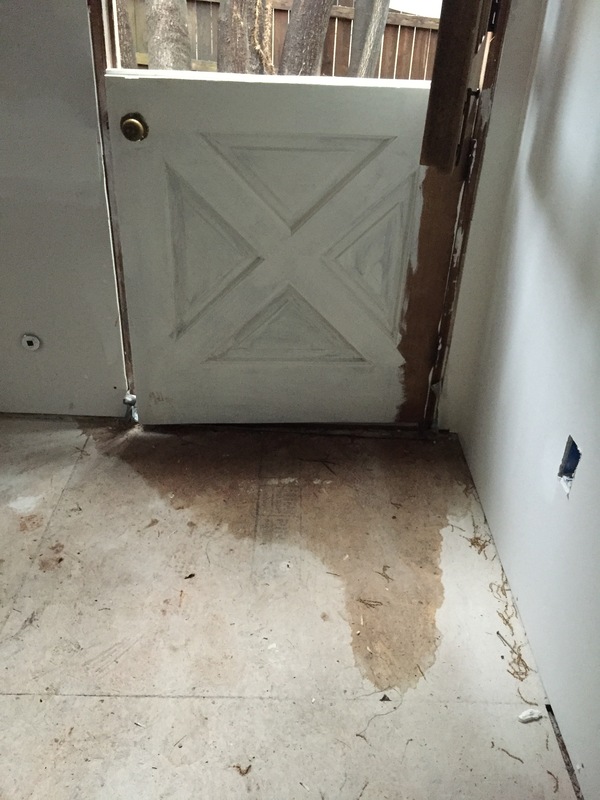 How hard could it be to convert an interior door to an exterior one? No big deal, right? Wrong. I’ve said this more than once, but It’s always those “simple” little projects that surprise you and turn into total marriage testers (Kidding! But it was not our finest moment. 😉 ). 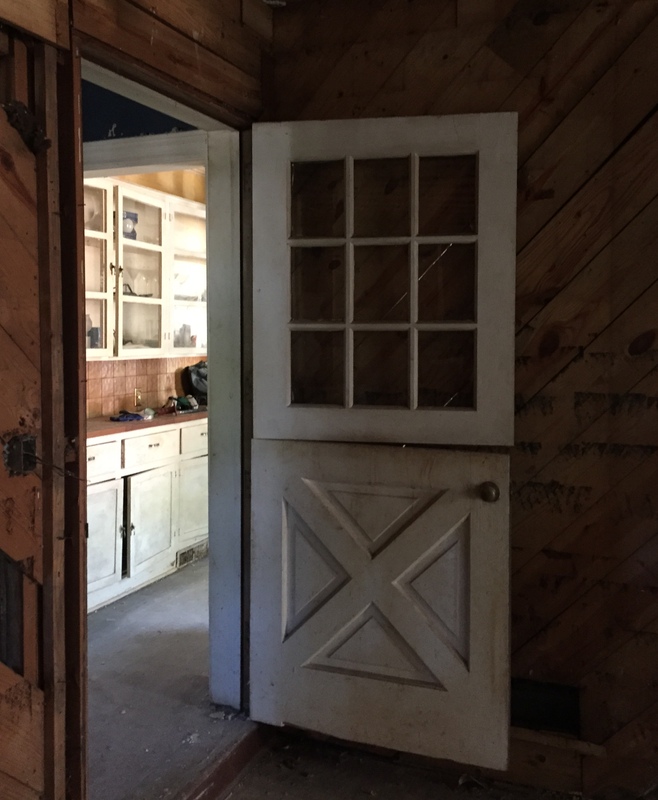 Besides the overall sanding, stripping and repainting, this sweet little Dutch beauty had to be weather-stripped and water-tested (there’s no overhang above the door, so we had to be sure it was watertight). We set to work adding weather-stripping to the doorframe, but didn’t realize we would also need to seal all the window panes and the split between the top and bottom halves of the door…until we tried the “hose test.” Despite our best weather-stripping efforts, she leaked like a sieve. I’ll spare you the boring details, but after several trips to Home Depot and failed attempts at a solution (not to mention, lots of wet towels and soggy feelings), we found a small rubber seal, carpet tacks, and a good caulk line did the job. Installed in her new home! “After” in the new location as an exterior door. …and make this baby watertight. Whew! I guess it was worth it! We’ve had our fair share of dirty jobs so far in this adventure, but this one literally involves shoveling mud. Anyhoo, we – thankfully – have concrete floors down there, but all the walls are good ol’ South Carolina red clay. I’m not going to lie, it’s pretty creepy and it’s currently home to an orchestra of crickets (…and maybe a few trolls and vampires?? Jury is still out.). Our hot water heater and lots of ductwork also live down there, but we won’t be using it for much more than an extra large crawl space. I will probably make an appearance every once in a while to hang some fresh garlic from the ceiling to ward off evil spirits and call it a day. Although this isn’t a high-traffic space for us, you know we still want it to look its best and when we arrived on the scene, it was in pretty bad shape. The big culprit here is, yet again, water damage. 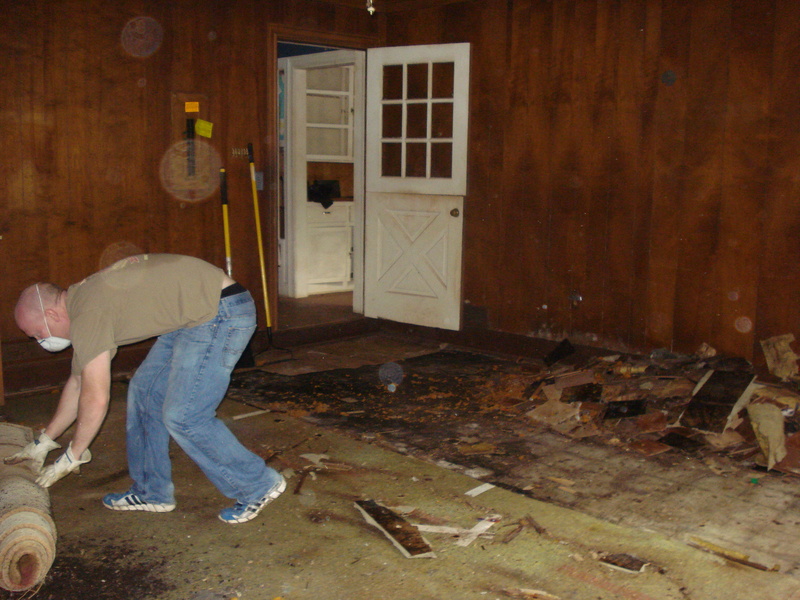 Since the house was vacant for several years with no power, the sump pumps in our lovely dirt-walled basement were not working…so you can imagine what happened next…yep! Mudslide. In fact, we didn’t even realize the floors were concrete until we started cleaning up because there was about an inch of dirt that had slowly washed down onto the floor over the years. Yuck! Matthew, my brave, hardworking husband, took on the challenge of basement clean up, which entailed a lot of mud shoveling, removal of a few lovely items like a lawn chair and an old mattress/box spring, and repairing the existing sump pump, so we can avoid any repeat performances. But he didn’t stop there, oh no! 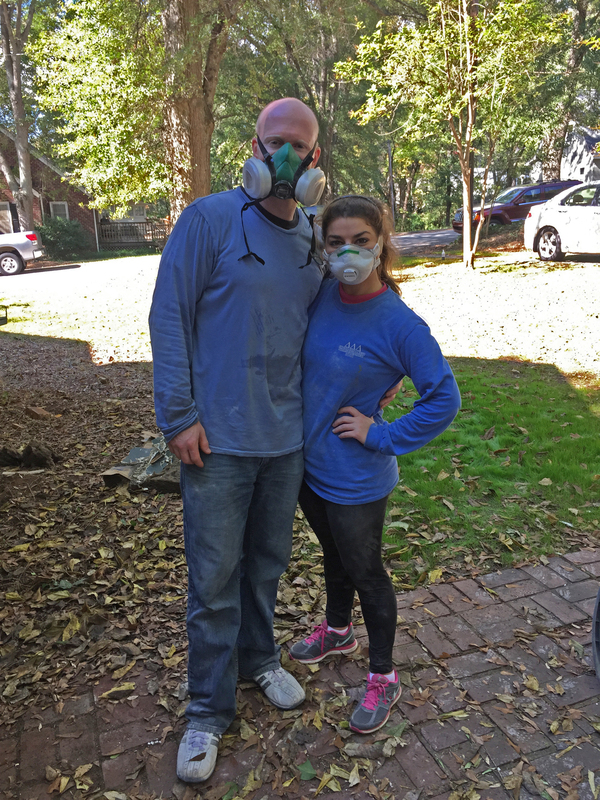 Matthew washed and sealed the concrete floors, and had the dirt walls covered with a moisture barrier, too. Never thought I’d be so proud of a basement, but this baby has come a looooong way! Our powder room may be small, but it’s got personality! There are so many things we love about this teeny little room, but one of its finest features almost didn’t happen! You may remember from the floorplan redesign that the Nest’s powder room is not an original feature of the house. 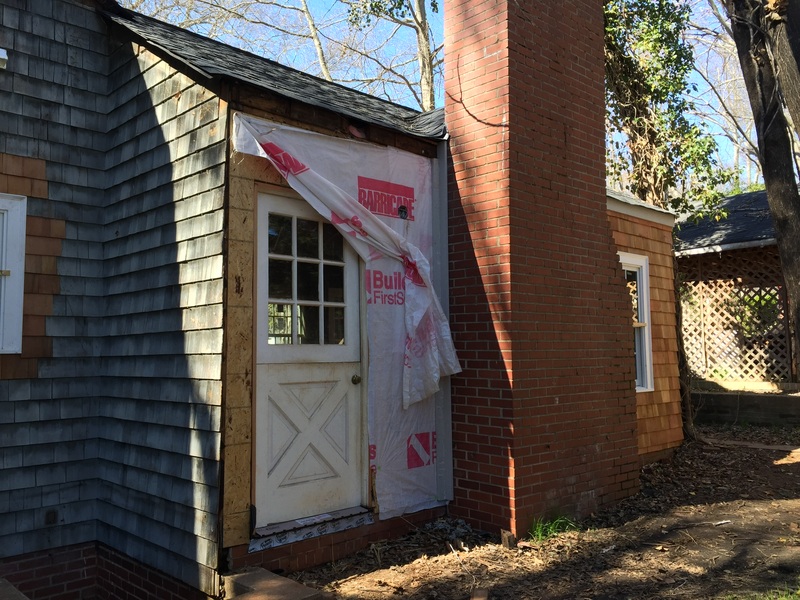 We decided early on that it would be smart to add a bathroom to the side of the house where all the living spaces are located (duh!). 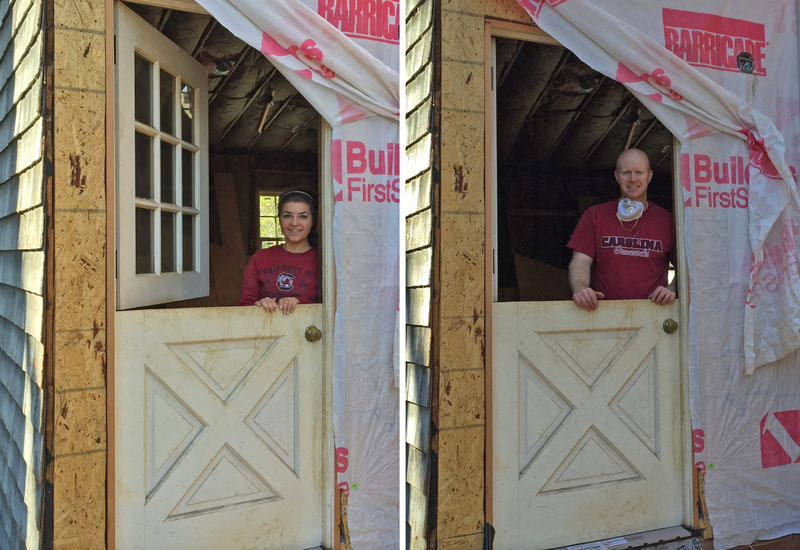 So, we added two little walls (and two pretty doors!) in what we call the office and – voila! – a powder room was born. Because we re-plumbed the entire house, adding another sink and toilet was relatively easy. 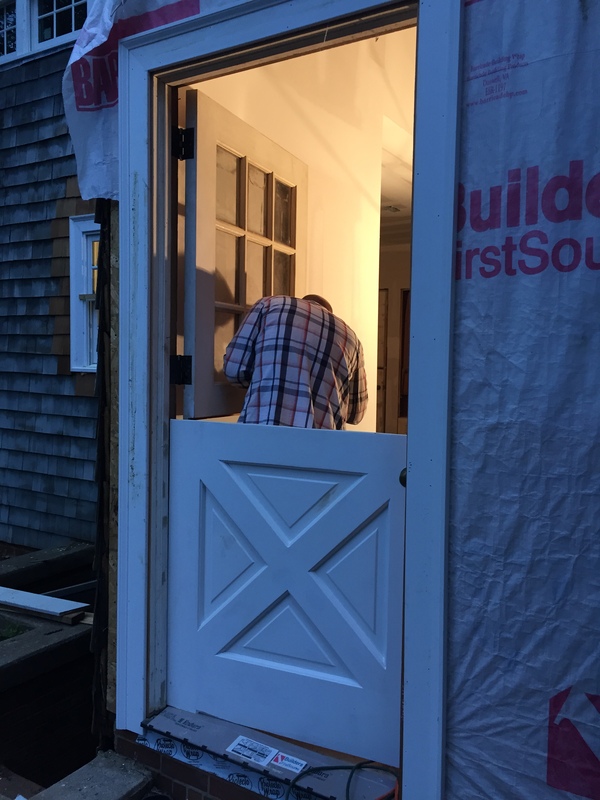 The challenge was making this little [water] closet not feel like an afterthought… so we decided to use the other half of the diamond-paned window that was originally in our master bathroom. Great idea, right?? Except: 1.) we only had one of the two window panels restored professionally (to keep in the master bathroom) and 2.) all the window openings had long been decided and windows installed months ago. Ugh! But Lauren we HAD to have this window! So, who did we call? My dad. The master at work! Removing old glazing and stripping the wood. Making the first cut; no turning back! I kid you not, adding this little window completely transformed our tiny powder room. Not only are we glad to have the natural light and a view of the Camelia tree in the side yard, but we saved and repurposed the other half of a very special original feature of our Nest. Win-win! I mean, can you even imagine this room without a window? Q: What’s shiny and white and mudded all over? Honk, Honk! The Nest’s bathrooms just got a little touch of subway flair…tile, that is. We chose a simple white, glossy subway tile for the showers because it suits our style and the era of our home. We punched it up a little by using pewter colored grout and adding a simple accent of “pencil tiles” around the perimeter of the shower walls about ¾ of the way up. We also opted to add little niches in each shower to hold shampoo bottles, etc. Besides being absolutely filthy, the tile in our nest’s bathrooms was in relatively good shape and because we decided to keep the old cast iron bath tubs, too (taking those monsters out would have destroyed the tile around them), we decided that it was a no-brainer to save the original tile. 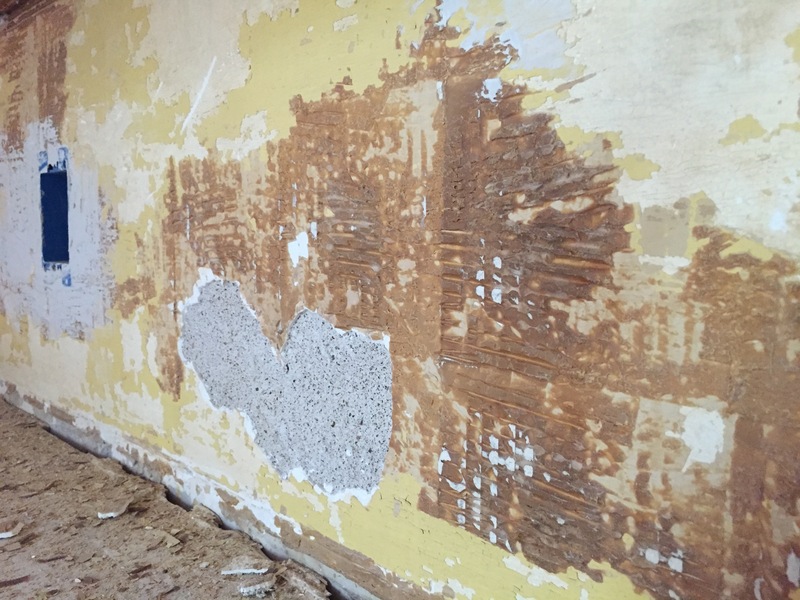 However, there were a few “snaggletooth” holes to fill where we had relocated doorways and some patching needed around the edges of the rooms where we lost a few tiles during the plaster demo. The only problem: it was impossible to find replacement tiles that would even come close to matching our original ones [insert “they don’t make things like the used to” comment here]. Our tile professional was too chicken to attempt concerned by the only option left: to “harvest” tiles from parts of the floor that would be covered by a vanity, so Matthew and I were forced to try our hand at chiseling out these precious tiles on our own. Thankfully, it was a DIY success not a disaster…although, it definitely tested our marriage a few times. Whew! Glad that’s over. Hard at work harvesting tiles. Grinding away at the space for a new marble threshold in the hall bathroom. Finally starting to clean up the old tiles! Many hours of elbow grease later…good as new! This orange KERDI backing is a moisture-proof “wallpaper”that goes right over the sheetrock before tile installation. Tile selection! 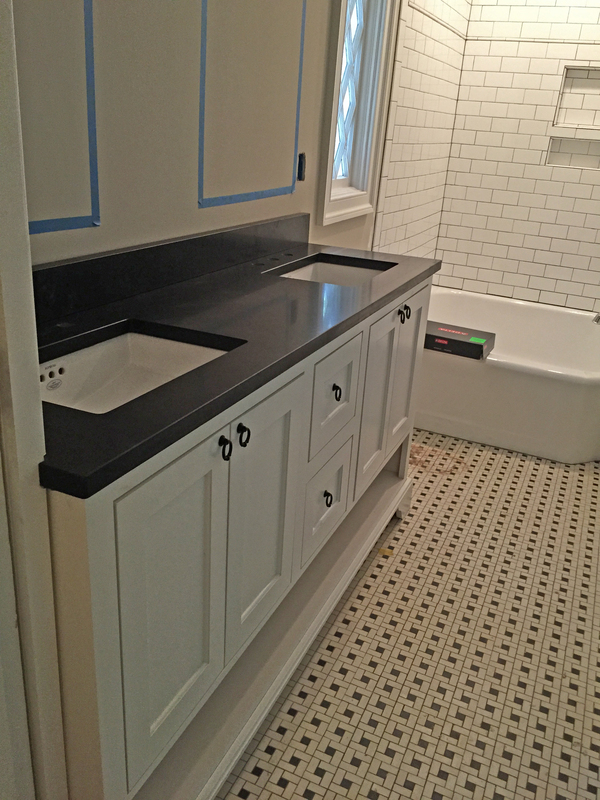 Classic white subway tiles and pewter grout (we went with the medium gray at bottom). Boxes and boxes of tile… here we go! Master shower’s tile is up! 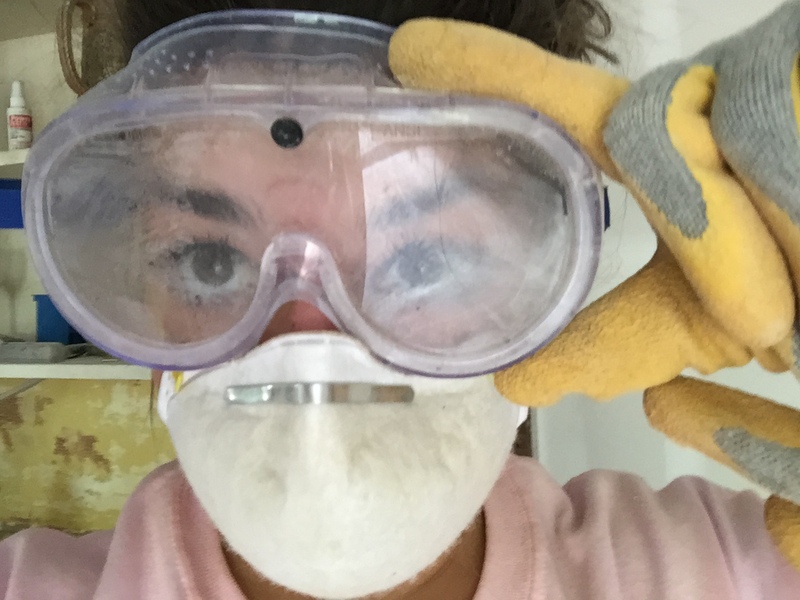 The miracle worker in action – scraping, sanding, and patching all the imperfections. Reglazing in progress… That orange contraption is a portable exhaust system to vent the paint fumes outside. Impressive! Can you believe how good this looks??? We were shocked by the transformation. It’s perfect. I think I heard angels singing when I laid eyes on our BRAND NEW old tubs!! 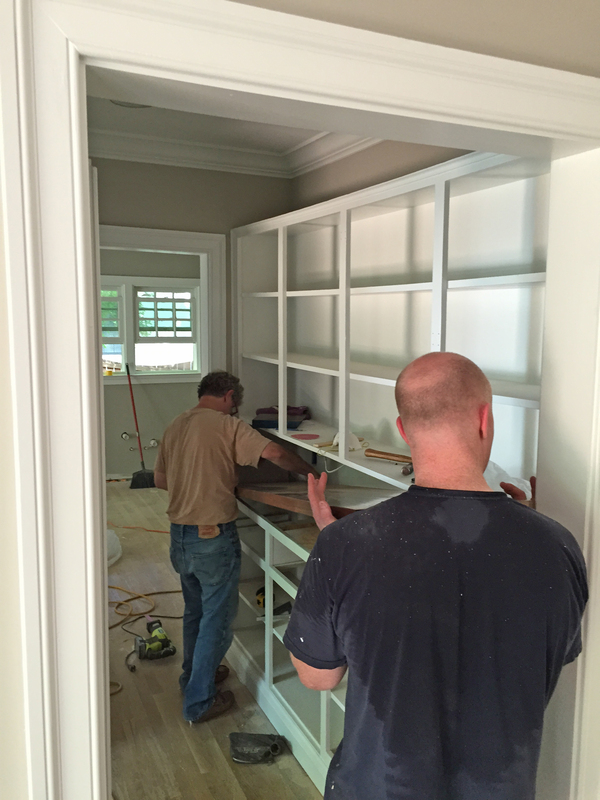 … but we sure do like his pantry! 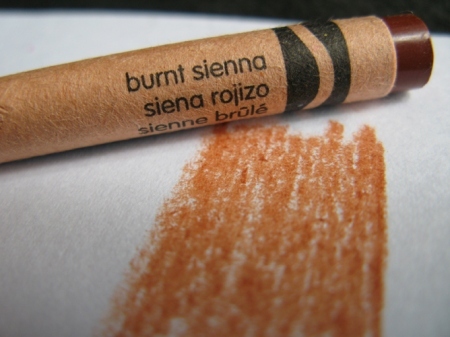 Burnt Sienna! A perfect match. Once upon a time, this delightful Crayola color may have been a popular choice, but not anymore! 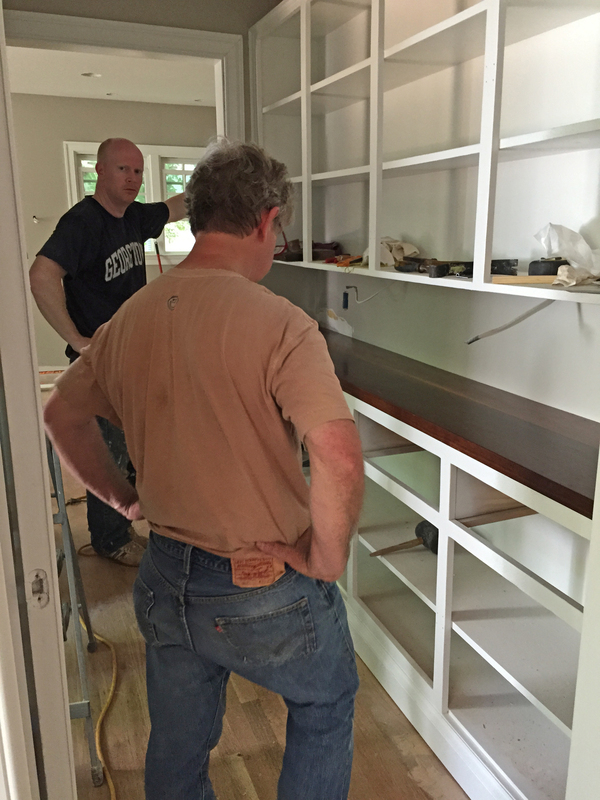 So, we had to bid farewell to all those little orange tiles and give the butler’s pantry a well-deserved makeover. First things first, I easily chipped away the tiles with a hammer and chisel because the adhesive had lost a lot of its strength over time. Unfortunately, the adhesive kept a very strong bond with the plaster wall between the upper cabinets and the counter top. I tried to chip away at it with every tool I could find, but finally had to resort to our orbital sander and heavy grit sandpaper. It was a dusty, tedious, goggle-fogging job, but I finally got it down to the smooth plaster underneath with only a little damage that required simple patching. Close-up of the stubborn glue left behind. I had to stop every few minutes to wipe out my goggles. Yuck! 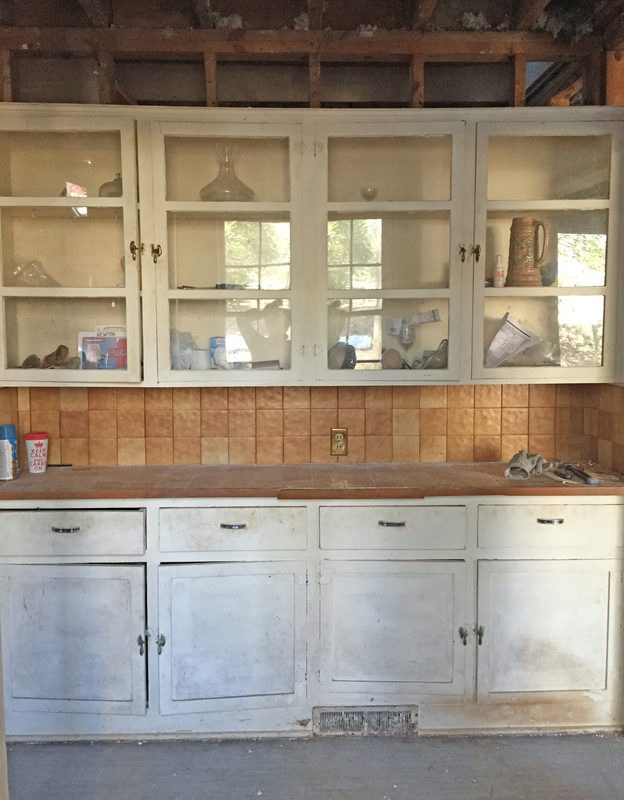 Next, we discussed what to use for the new counter top that would complement and preserve the charm of the original cabinets. 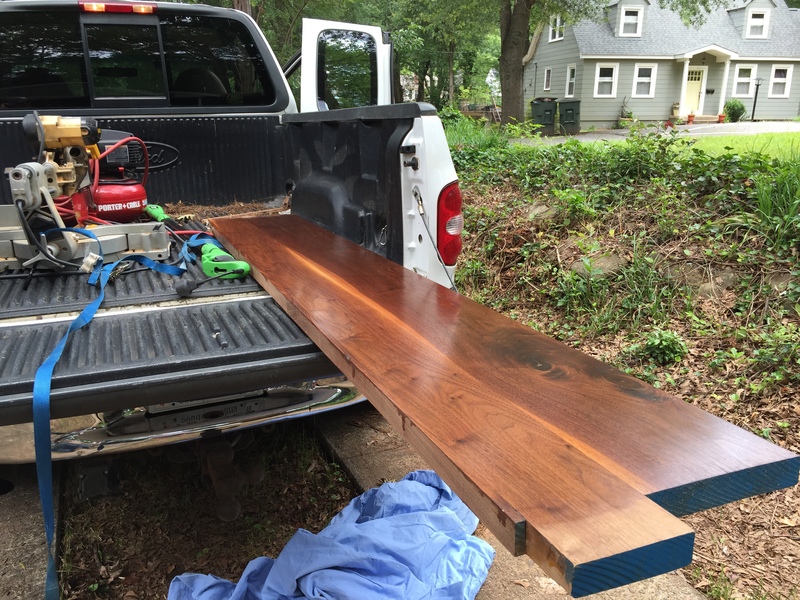 We landed on the idea of “up-cycling” some of the original ceiling joists we cut out to vault the ceilings in the family room and master bedroom. 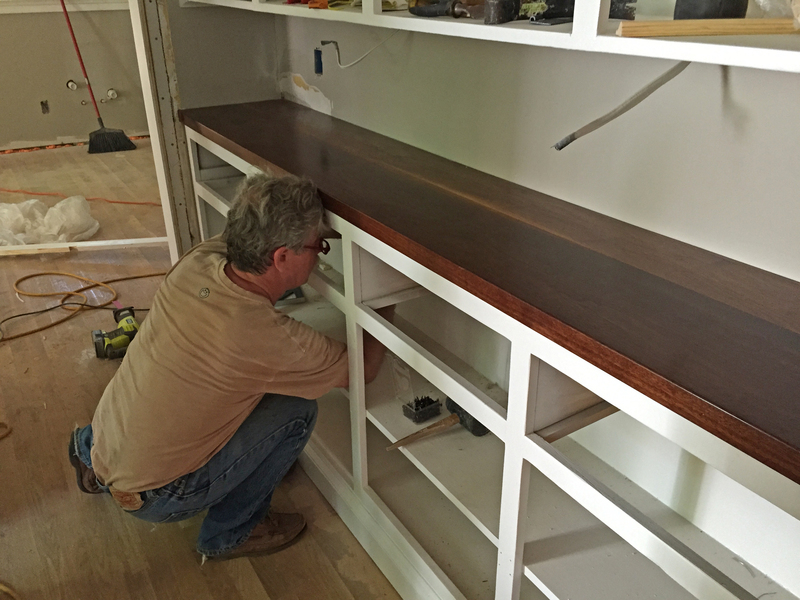 We took this idea to my dad, the forester and master craftsman, to request his expertise and ask for his help to bring the new counter top to life. Naturally, he had an ever better idea! 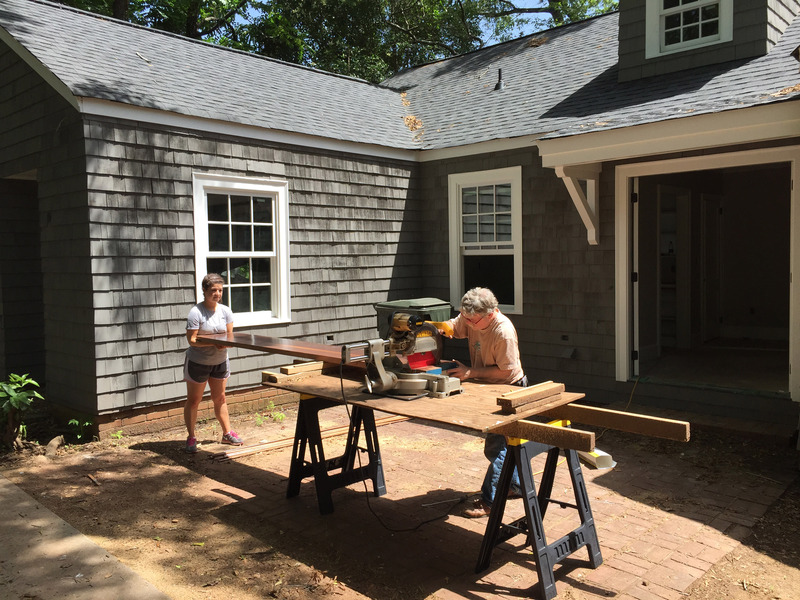 Our joists were certainly thick and sturdy enough to do the job, but they were made of pine. 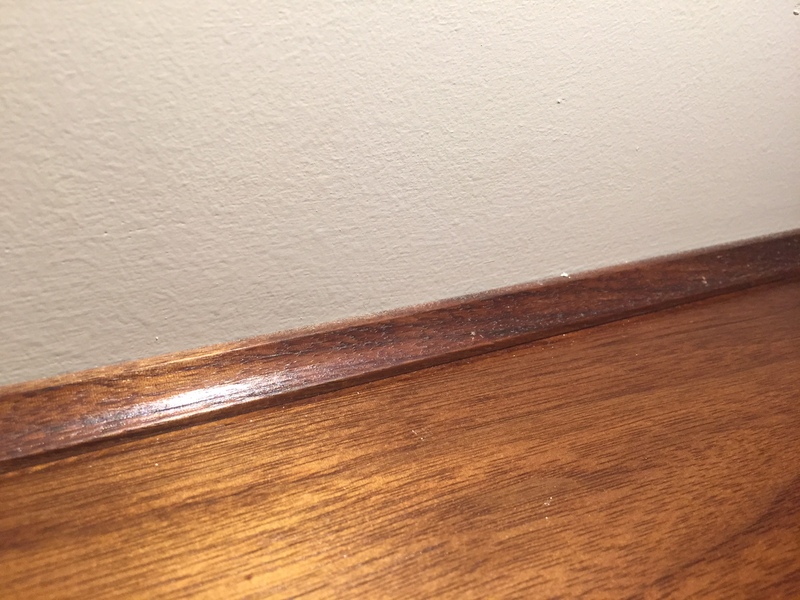 As mentioned in the floor refinishing post, pine does not stain well and our “vision” was of a darker, richer wood counter top, not raw pine. It just so happened that my father (the forester, master craftsman, AND wood hoarder 🙂 ) had a stash of beautiful walnut left over from when my parents built their kitchen island. Glory! It was just the thing. 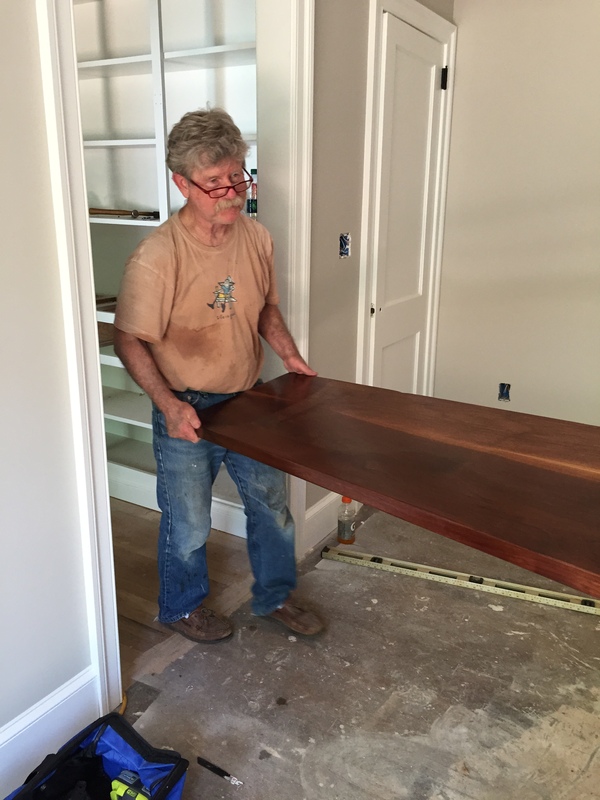 We are so fortunate that the Harpers were willing to part with such special materials and my dad created a handmade walnut counter top for our butler’s pantry by joining two large pieces together and lovingly applying coat after coat of tongue oil and polyurethane. Cutting it down to size. Ready to install this beauty! Fastening it from underneath, so we don’t mar the wood. 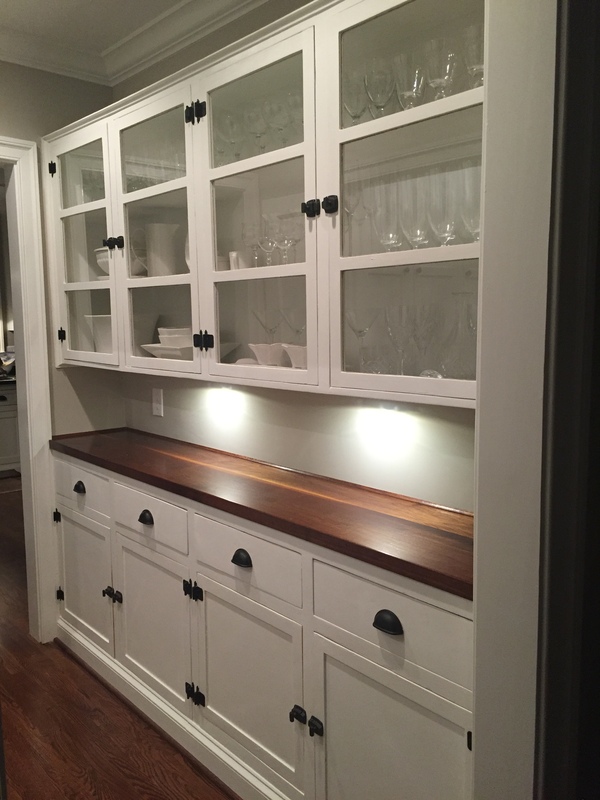 My dad also made a matching cove molding to give it the perfect finishing touch! Ta-daaaaahhh! The finished product. Absolutely fantastic. Meet me at the stone yard, honey! 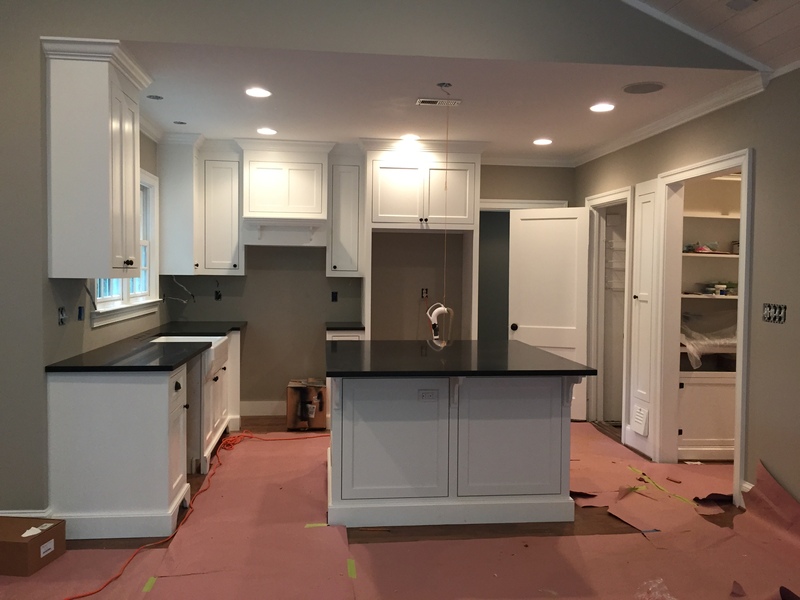 We need counter tops. 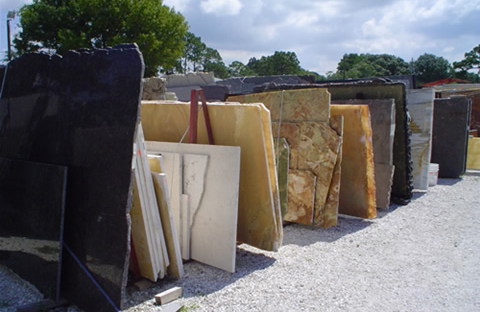 Selecting counter tops was one of the few decisions that we went into knowing what we wanted from the get-go and there really wasn’t much deliberation. 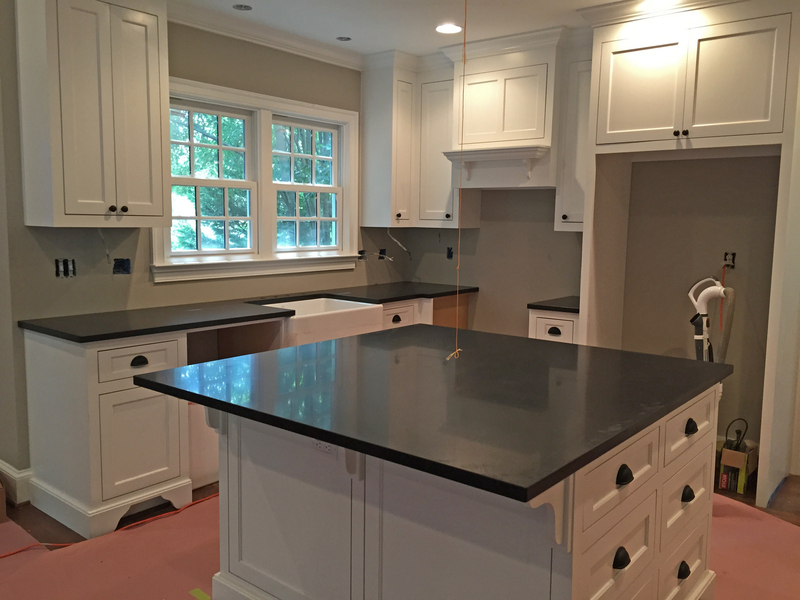 For the kitchen and master bathroom, we chose granite in Absolute Black and for the hall bathroom we wanted something a little more fun, but with a timeless, neutral color palette. …and we found it! 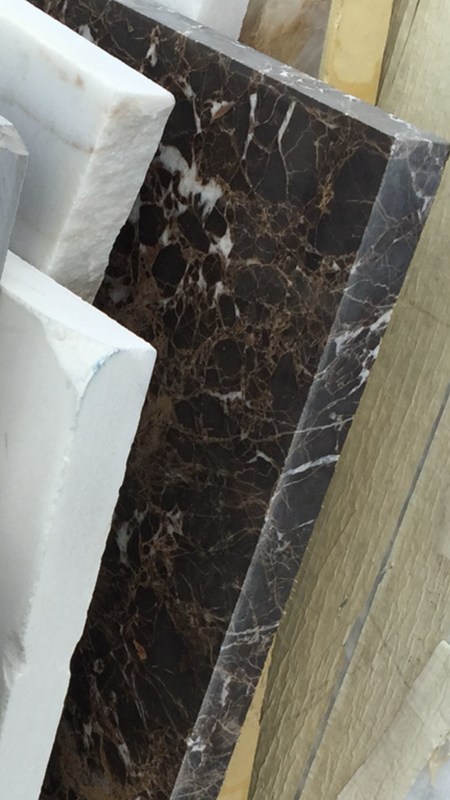 Dark Emperador is the name of the marble we chose. 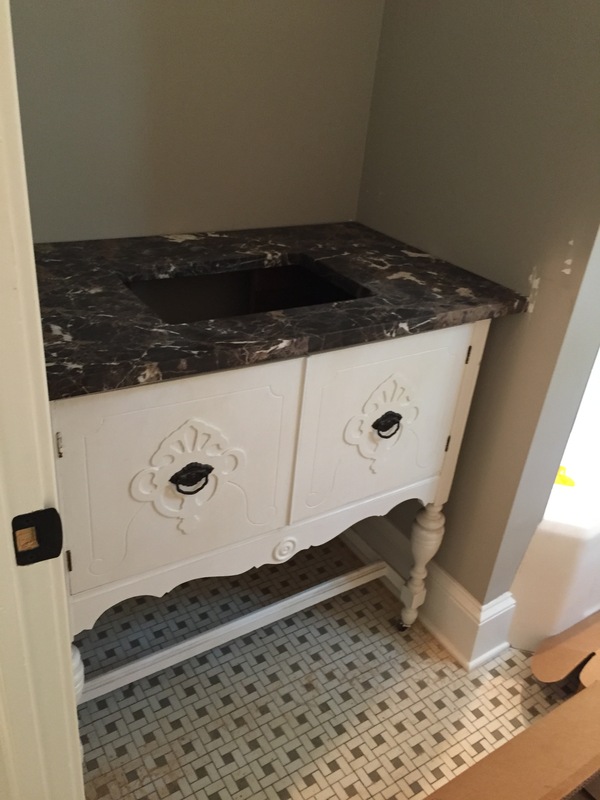 It was just a lowly scrap, but it became the crown jewel of our hall bathroom vanity! Welcome to The Newton Nest! 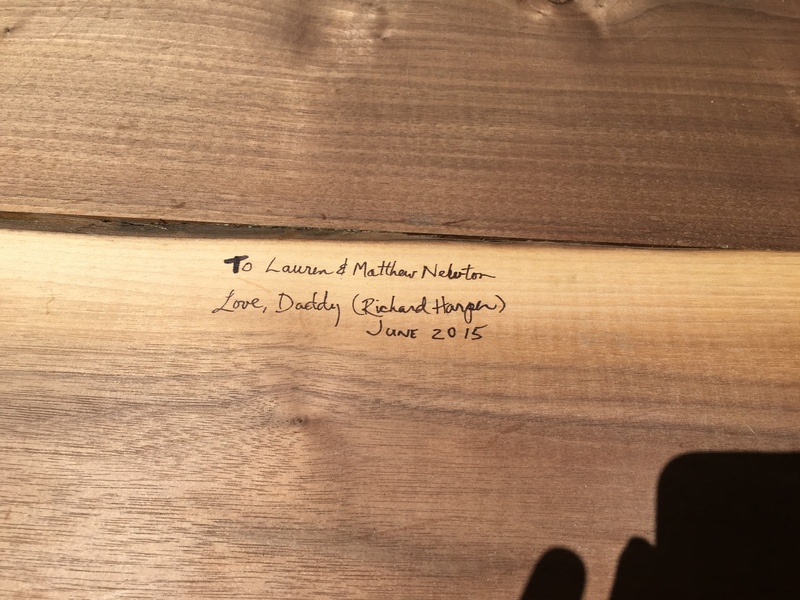 Lauren and Matthew Newton are two love birds (or Dodo birds?) 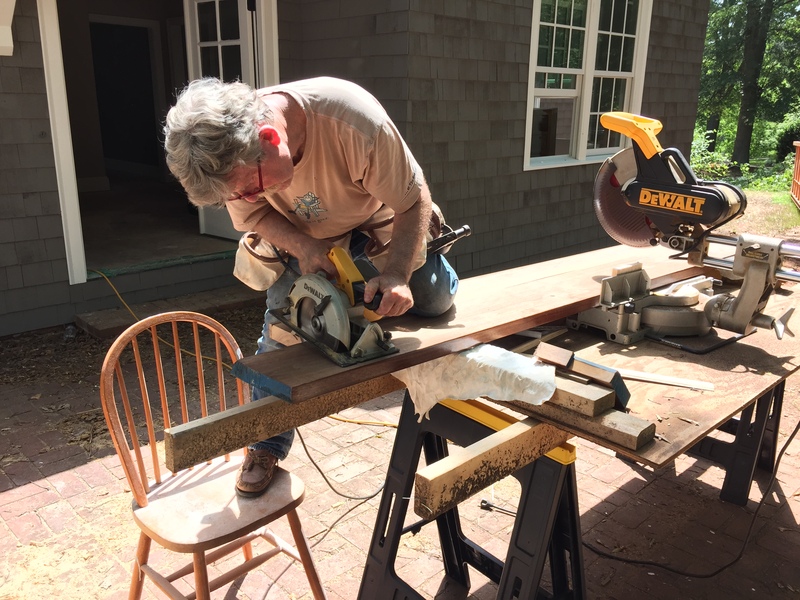 taking on the project of a lifetime—renovating a 1940s Cape Cod into their dream home.